You have the chance to obtain a Trans Am that looks just like this one! James Bond’s Aston Martin. Starsky and Hutch‘s Gran Torino. The Dukes of Hazard‘s Dodge Charger. Many classic films and television shows remain in our memory not just for their characters but for the cars that drove themselves out of the television sets and into cinematic history. While most of us have settled on owning die-cast toy replicas or getting our picture taken with painted imitations at cruise-ins, one lucky (and quite wealthy) person will get to own an official Pontiac Trans Am from 1977. 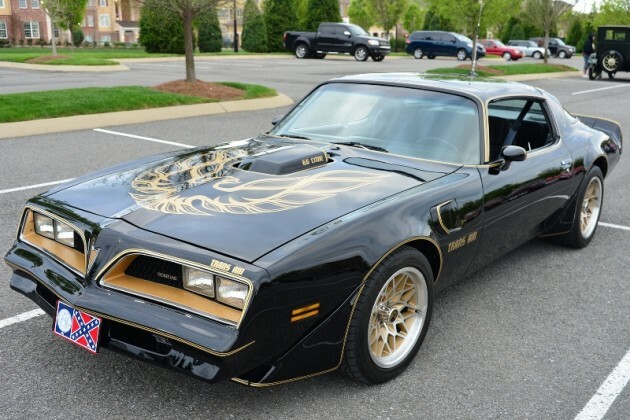 Burt Reynolds is auctioning off his possessions, including a snazzy Smokey and the Bandit car. Mind you, this 1977 Pontiac “Firebird” Trans Am T-Top Coupe isn’t the actual one used in the movie, but it’s still officially-licensed (which can’t be said about dozens of homemade imitations at local cruise-ins). The vehicle up for auction, which was created by the studio to promote Smokey and the Bandit, was bestowed upon Reynolds as a keepsake and only has 12,000 miles on it. The lucky owner gets to bask in the 400 cid V8 power, 4-barrel carburetor growl, and slick automatic transmission. Plus, another vehicle (a custom-painted ’78 Trans Am owned by Reynolds for five years) will be sold by Mecum Auctions in January. If you think not many people these days remember Smokey and the Bandit, just look at the pre-auction numbers. The starting price began at $30,000 with the original estimate around $60,000, but bidding has already crossed the $75,000 mark. Burt Reynolds is auctioning off nearly 650 items he’s collected from movies over the years, everything from a letter from Katherine Hepburn and his 1978 People’s Choice Award (and no, his mustache isn’t one of them). It’s surmised this “fire sale” could be in reaction to the Bank of Florida’s lawsuit of $1.4 million against the star for late payments on his Florida home. Get your bid in here by December 11th before the live auction takes place in Las Vegas!